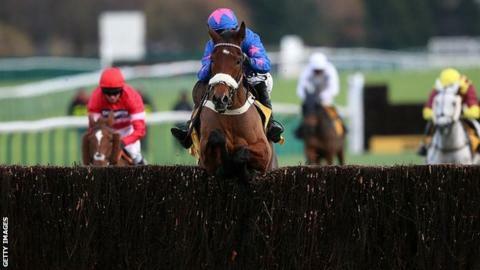 Cue Card stormed away from last year's winner Silviniaco Conti to claim his second Betfair Chase at Haydock. The Colin Tizzard-trained nine-year-old (7-4) took control at the second last and won easing up, with Dynaste third. Cue Card suffered pelvic problems after his 2013 success but returned to win the Charlie Hall Chase at Wetherby last month. "The way he rode today he felt like a Gold Cup horse," jockey Paddy Brennan told Channel 4. "It was unbelievable." Brennan dedicated the win to the victims of the Paris attacks, in which 130 people were killed. "I was lucky enough to ride some winners in Auteuil and we are all thinking about them," he said. Silviniaco Conti, the 5-4 favourite, made a gallant attempt to win the race for a third time as he set a good gallop, but Cue Card was never far away. Brennan moved him level with the leader before the four fences in the straight and he drew away to take victory by seven lengths. Cue Card will win a £1m bonus if he follows up Saturday's win with victories in the William Hill King George VI Chase and Betfred Cheltenham Gold Cup. The prevailing theme to this jumps season of popular comebacks continued here as Cue Card built on a recent Wetherby success, his first for nearly two years. The nine-year-old, who put in a really sparkling performance to beat Silviniaco Conti, follows the recent returns to winning ways of Bobs Worth, Sprinter Sacre and, in Ireland, Sir Des Champs. A rejuvenated Cue Card versus Silviniaco Conti, the not entirely convincing Ascot winner Vautour and maybe Coneygree in the King George on Boxing Day should be one to savour.